I am on a mission to get fun, quality nonfiction in the hands of my students. These are picture books that I begged our school librarian to order, and I'm so happy she did! Ben Franklin was really amazing, wasn't he? 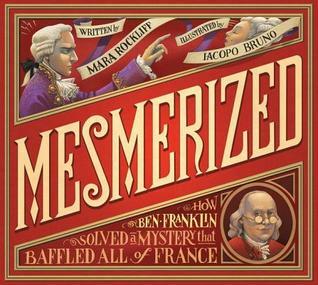 Mesmerized tells a story which would be the centerpiece of most biographies, but for Franklin, it's a little known aside. It recounts how Franklin used the scientific method to disprove a charlatan, create the placebo effect, and coin the word 'mesmerized.' There are so many different subject areas covered, all in an appealing book about how a brilliant man was a buzzkill for Marie Antoinette. What could be more fun that that? Iacopo Bruno's illustrations draw the reader in and add to Mara Rockliff's engaging writing. man who conned Al Capone and lived; who escaped from prison; who impersonated a count to swindle people on a cruise ship. All of this is true, and more, about Robert Miller. Nonfiction books don't always have to be about heroes. Miller was a con man who spent his life tricking people in a variety of ingenious ways. 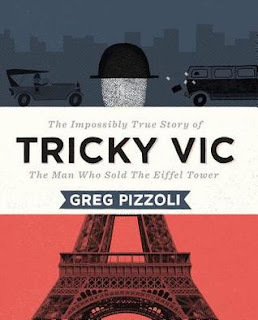 That's what makes Tricky Vic so much fun: the reader has no idea what will happen next, which is even more incredible when you consider that it's all true. The mix media art and color scheme lend to the "cool" mood of the book. I especially love that Miller's face is always just a fingerprint. Since he spent so much of his time under various aliases, this is the only way the reader knows it's really him. This should be in every 4th and 5th grade library. Inventors seems to be a standard unit theme for upper elementary students. Most kids learn about Alexander Graham Bell and the telephone, or our man Ben Franklin and the lightning rod. I love the idea of taking it further and learning who invented the small trivial items that make our life easier. Nothing earth shattering, but people who gave us more comfort. 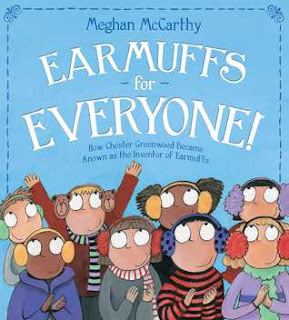 Meghan McCarthy had the same idea when writing Earmuffs for Everyone! As we learn in the book, Chester Greenwood wasn't the first to invent earmuffs, but he innovated and made them easy to use and fashionable. Innovation is such an important skill for kids to learn and is far less daunting than "invent something." Readers will come away inspired to think of how to improve ideas that already exist. I want to read more of Meghan McCarthy's books.